The unique combination of the highest quality and beautiful styling are what make our yurts stand out. The natural chestnut frame and solid oak crown are covered with our wonderful weatherproof canvas covers, fully rain-proofed and tailor fitted to your frame. Because our canvas is of the highest quality you can save some money as there is no need for "winter covers". We offer three distinct levels of specification, standard, insulated and glass wall yurts. Each is available in a variety of diameters from and bespoke yurts from 10 foot (3m) diameter up to 25foot (7.62 cm). The standard yurt is a natural finish chestnut frame with the traditional 8-spoke oak crown. We cover the frame with our superb quality canvas covers, tailor-made for your exact frame. The quality canvas we use is specially made to order. It is water, fire and rot-proofed to a very high standard to ensure the canvas will not leak whatever the climate. We go the extra mile with proofing so you can relax knowing you have the best-proofed canvas available. We offer three colours as standard, a creamy white, the very popular sand and light sand. Other colours are available on special order. We offer different colour crown covers and an option for a PVC window in the crown and walls. "wow...that is all I can say when I gaze up at the beautifully crafted oak crown you have made..."
A focal point and surely one of the special features of our yurts is the solid 8 spoke crown. Nothing compared to the view from inside one of our yurts. Made from either oak using the traditional design and joinery, and modern glues, it is not only beautiful but solid too and will last and last. The chestnut wood we use is totally unique to our yurts, it is another of the main features that set our yurts apart. We strip the wood leaving traces of colour, and when this is oiled it gives a beautiful golden brown hue. The wood looks alive, vibrant and contributes to the overall natural and relaxed feeling you get in one of our yurts. Our insulated yurts are extremely popular with you and they have the same frame and oak frown as the standard yurt but we add a layer of wool-felt insulation and inner liner. In fact, we are the UK and European experts when it comes to insulation. Check out this page for more information on our Insulated Yurts. A glass wall yurt is the height of yurt luxury with a section of the yurt wall built from glass panels. 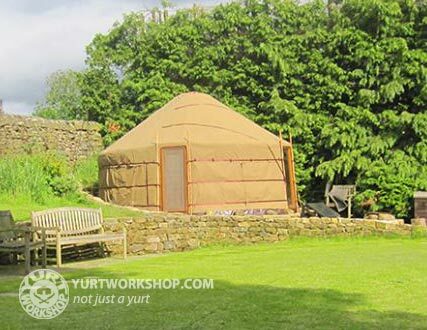 These yurts have proved to be very popular.